The report revealed complaints about littering had dropped from 37 to 16 from April to September 2017, compared to the previous six months. The number of environmental complaints in the Kirkcaldy area have dropped in the last six months. The figures are revealed in a report by Fife Council’s Safer Communities Team which went before members of Kirkcaldy area committee on Tuesday afternoon. Complaints about dog fouling fell from 132 to 75. From April to September 2017, compared to the previous six months, the report shows that complaints about: abandoned vehicles had decreased from 170 to 136; dirty gardens had dropped from 161 to 81; dog fouling from 132 to 75, illegal dumping from 379 to 229; and littering from 37 to 16. This showed an overall reduction in complaints from 879 to 537. The report also reveals the number of fixed penalty notices, over the same period, issued for these offences. For dog fouling three fixed penalty notices were handed out by Safer Communities officers, with the same number issued over the previous six months; four were issued for illegal dumping compared with nine for the previous six months, nine fixed penalty notices were handed out for littering compared to 19 in the previous six months and one fixed penalty notice was handed out for noise with none being issued in the six months previously. Neil Crooks, committee convener, said the report showed there were a lot of abandoned vehicles in the Kirkcaldy area with some s lying in areas for a year or two. Complaints about illegal dumping dropped from 379 to 229. He asked how this issue was being investigated. Paul Coleman, Safer Communities lead officer. said: “In the first instance we locate the vehicle and then we try and speak to neighbours in the area to try and find out who owns the vehicle. ‘‘We then put a sticker on it to let people know we are aware. If someone claims it, the process ends. If not, we make the DVLA aware for it to pursue the owner. Councillors also expressed concerns about dog fouling, with the low number of fixed penalty notices issued. Mr Coleman said: “Dog fouling goes up during the darker months making it harder to witness offenders. We do have a mobile CCTV unit for Kirkcaldy and Burntisland. He added that a new process for handling dog fouling complaints is currently being examined. 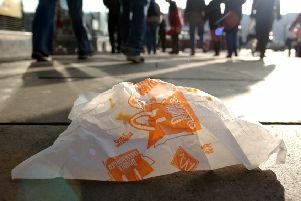 In terms of targeting littering offenders, the report said high visibility patrols around local high schools during lunchtimes were proving to be effective as well as encouraging young people to dispose of litter appropriately. Burntisland councillor, Kathleen Leslie, said littering was a particular problem with pupils from Balwearie High leaving rubbish behind in the Invertiel area.